1. Time to pay aguinaldos (the pay from a 15 day period => 15 day Aguinaldo x (# days worked per year/365) x $$ what you pay them per day). 15 day Aguinaldo x (52 days/365 days) x $50 pesos a day = $106.85 peso Aguinaldo. 2. INM office will be closing for Navidad y New Years after Dec. 19, 2014. 3. The season of La Rama is underway. Groups of boys & girls have started their nightly “caroling”. If some kids ring your doorbell and start singing, turn on the lights out front and find your coin purse: you may have your first foto-op of the season. 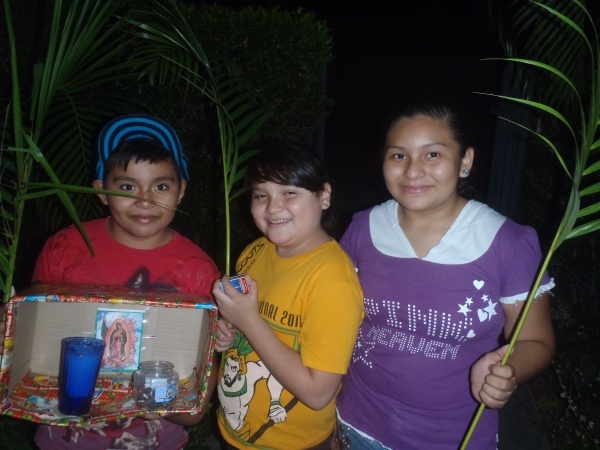 Children carry little homemade alters, set-up in cigar boxes, lit by a candle, and sing a series of La Rama songs during the weeks before Christmas (antes de Noche Buena y Navidad). Groups of runners, walkers, cyclists, making their way to the Nuestra Señora church at La Mejorada on Calle 50 y 57/59. Head on down in the evenings and have fun listening to the pilgrim’s stories and festive atmosphere, culminating on Dec. 12, el Dia de la Virgen de Guadalupe. That multiple should be 14, not 15. Fifteen is just a Mexican oddity in which they believe two weeks consists of 15 days. It’s a verbal, not mathematical, matter. Readers should note that numerous reliable accountants disagree with Felipe’s personal opinion on the 15 day issue. Mexican law specifies 15 days. Why cheat a worker out of 1 day’s pay? Years of amateur internet posts mistakenly oversimplify equate the law’s “15 days” to mean something that is mistaken / incorrect, falsely changing it to a memorable – but incorrect – “2 weeks”. Note that many internet posters mistakenly try to apply Canadian or US standards to Mexican Labor Law. Consider that when a Mexican worker is hired to work by the week, the daily rate is the weekly amount divided by 7 (not the USA’s “5”). If he is hired by the month, the daily rate is the monthly amount divided by 30. The Mexican legal accounting standard of calculation is very different from the accounting that the USA and Canada uses. The aguinaldo must equal 15 days of salary. To calculate the Aguinaldo for a part-time employee, divide the total number of days worked during the past year by 365, then multiply that figure (total days worked per year fraction) x the 15 day Aguinaldo x the daily salary to determine the amount of the aguinaldo. (52 days/365 days) x 15 day Aguinaldo x $Pesos per day = Annual Aguinaldo payment … due by Dec. 20. Math whiz folks can see that Felipe Zapata’s 14d claim does not fit what professional accountants advise. If we use Felipe’s personal idea, then we underpay the worker – cheating them out of some of their legally-owed pay. This entire matter is a nice example of the Alice in Wonderland aspect to much of Mexican culture, thinking and life. You’re supposed to pay the equivalent of two weeks. That is the intent. Problem is that two weeks to a Mexican, including those who write the tax law, obviously, consists of 15 days. Of course, two weeks are 14 days, not 15 (count them on your fingers if you’re in doubt) but try to tell that to a Mexican. And, of course, one week to them consists of eight days, not seven. And if one week has eight days, then two weeks would have 16, not 15. Oh, now I have a headache. I once asked my wife, an actual Mexican not a made one like me, to count on her fingers to prove a week has eight days. She started with Sunday, counted till the next Sunday, counting the Sunday on each end of the week. Voilá, she had her eight days. I then asked her to explain then how two weeks could have 15 days instead of the logical 16, according to her way of counting. I think she had to go sweep the floor at that point. You are free to believe whatever you like. Readers should trust that the Mexican Ley de Trabajo says to pay “15 days” (quince dias). People can choose for themselves whether to pay what is legally owed, or to use personal opinions to justify short-paying their employees. We see no good reason to cheat workers out of 1 day (7%) of their pay, as Felipe proposes.